Here is a cut and paste from Peak Oil forum. As I recall, Moroni provided Smith with magic spectacles that enabled him to read the ancient text on the tablets.I believe Joseph Smith’s father was considered to be something of an eccentric treasure hunter who claimed to know where buried treasure was hidden, but never seemed to find any. It is interesting that his son Joseph claims to have discovered not only buried treasure in the form of gold tablets, but on those gold tablets were inscribed the account of Jesus descending to North America and living among the natives. If that’s not the mack daddy of all buried treasure, I don’t know what is. I’ll bet those people who made fun of Joseph Smith’s father regretted that when they learned what Joseph had discovered. If I am incorrect about any of the above, please discuss. Father and Son treasure hunters? Looking for a National Treasure eh? Art = Life = Art = Life … eternal cycle perhaps? In pursuit of 2 gold tablets perhaps? Hey I too am a treasure hunter but I follow a path less traveled. It is an archetypal journey through a fabled land that uses ARKetypes to tell its tale. A story about the pursuit of a spiritual gold that lay within each and every person born into the realm. Archetypes transcend cultural boundaries…because they emanate from within…thus people do NOT need to migrate from point A to point B for an idea to travel…this is one of the errant paths the modern archaeologists follow…my contention supports the 100th monkey theory. 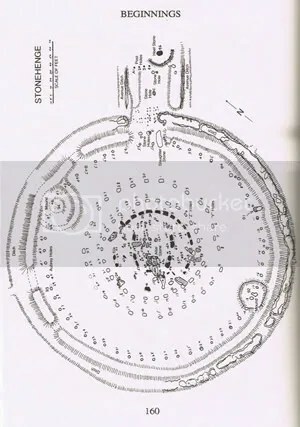 The gold tablet I found is referred to as a lozenge, and it has profound esoteric connections to Stonehenge…and Stonehenge has been shown to be aligned with/to Giza Pyramids. What was the Bush Barrow Lozenge artefact, found in a Tumulus mound near to Stonehenge and how is it similar to the Urim and Thummin, carried in an ephod vest by Hebrew priests? Bush and Uma Thurman connected esoterically? Please note the 3×3 grid at the center of the lozenge. Here lies a gate…represented by 9 squares. How important is the number 9 to a pagan? How important was the number 9 to Gurdjieff? i.e. the 4000 year old enneagram was a key to unlocking the mind. And need I mention my biggest supporter about the number 9 and a mathematical musical God? Shall we call this 3×3 gate the Sudoko gate? A puzzling portal to the mind? Popular game because of its archetypal ARKitecture. Tic Tac Toe is another product or game invented, another example of the engineering that exists within us…the same mechanisms existing on every level of an asymmetrical universe. Tic Tac Toe is an asymmetrical game…one opponent occupies 4 squares and the other occupies 5. And who would be in charge of the X’s (men) and O’s (women) … running the show from behind the scenes? 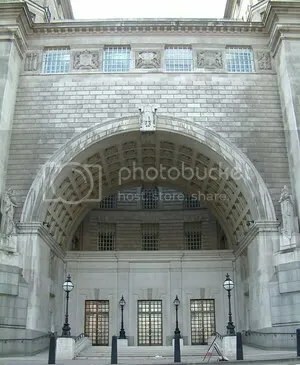 Image on the left is Mi5 Logo and the second image is their headquarters. As a side note: take a look at your keyboard, the upper case or Macro letter/number relative to the lower case Micro letter/number… it is the relationship between the numbers and the symbols above them that I find fascinating…for a moment imagine the numbers to represent a ‘dimension / perception’ … now look at the symbol this number shares for this particular KEY. So try to imagine for a moment that the qwerty numbered keys represent dimensions = D.
2D = @ at where? 4D = $ money makes the world rotate counterclockwise once ewe enter the matrix. I just want to point out, and this is important when playing the game of comparative alchemist, alchemy is a game played using archetypal analogy to access greater depths of understanding that exist between the microcosm and the macrocosm. Now what if you can place one symbol over another and learn soooooo much? The same geometry suggesting they might be measuring the same event. What event would be worth documenting the world over? Which in itself was made to resemble both a Lock and a Key. 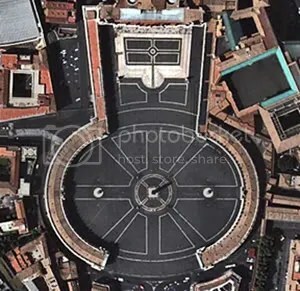 Please note both St. Peter’s Square and the Bush Barrow Lozenge are both oriented toward the east … the Sphinx also is oriented toward the east. Could the Bush Barrow Lozenge be used as a KEY to unlock secrets if placed over the Lock at St. Peter’s Square? IMHO I believe it can be. I believe the mandala I found and the Bush Barrow Lozenge are without a doubt hinting at the same cosmological geometry. 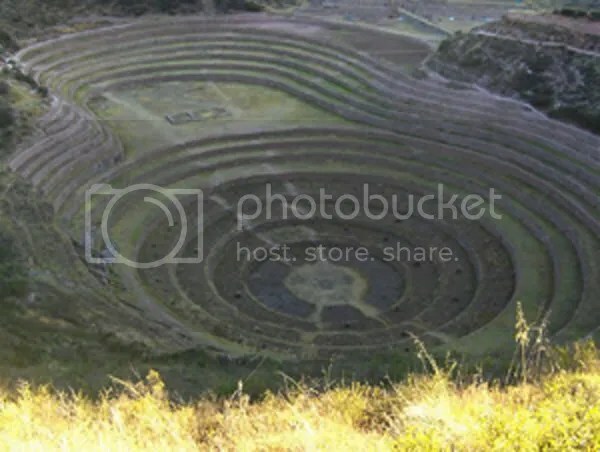 This image is from a place in Peru called Moray. Please note the rectangular image on the grass just outside the concentric rings. This rectangle or door is in the same position as the black door we see in St. Peter’s Square and the location of the Heel Stone in Stonehenge. All of the above are referencing the Platonic Year. Science and art were being directed by the priests and theologians at the time, and they in fact renamed the Platonic Year also known as the Great Year, to the Precession of the Equinoxes, 200 years after Plato died. Suggesting the Holy Spirit has a connection to TIME itself. Seven doves surrounding a circle which contains the letters “SS” (Spiritu Sancti, Latin for Holy Spirit) represent the seven gifts of the Holy Spirit given in Revelation 5:12 — power, wealth, wisdom, strength, honor, glory and praise. A different list of seven gifts from Isaiah 11:2,3 — wisdom, understanding, counsel, might, knowledge, fear of the Lord, and delight in the Lord — is sometimes used in the interpretation. Precession of the Equinoxes and Time is the name of the game taking place in the 3rd (#) and 4th ($) dimensions. And in the middle ages the symbol $ = ? A little qwerty birdy told mi so. Heel Stone? By the way:Jacob is Jah-Aceb of Jehovah-Heel, the Heel God. “Thou art Peter and upon this rock I will build My Church(…) and I will give you the keys of the kingdom of Heaven(…)” – MATHEW 16:18 -19 note: 16:18!!! “This true story takes place in 1947. John Nash is a student at Princeton. John is a genius at math and has this brilliant mind where he see things in geometric patterns..for instance he see pigeons eating crumbs from the ground but he see these pigeons creating a ‘defined geometric pattern’ as they go about their task of eating. He was not so crazy! that story about John Nash and how he sees in geometric shapes is great bianKA. Nash was right. So right he was at St.
Elizabeth’ Hospital together with Ezra Pound… . a wee bit synchronicity happening here bianKA, just yesterday I was reading something about Ezra Pound. and a while back I purchased a print in a garage sale, of the Great Cross, in Kells, Co., Meath circa 1899.